Welcome to Shaylor’s Ponds & Patios of Williamsport, PA. We strive to offer exceptional property care and beautification services for our valued clientele throughout the Northcentral Pennsylvania region. 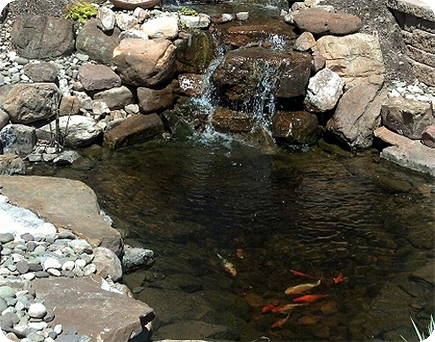 We serve clients within an approximately 60-mile radius of Williamsport, PA. With your input and our expertise, we create stunningly attractive and relaxing outdoor backyard pond installations for our customers. Relax in the comfort of your own backyard following completion of your workday and on your days off. Enjoy the additional free time that you gain from ceasing to search for the haven of your dreams on the weekends. Build your own personal escape right in your own backyard and enjoy your own personal outdoor living space any time in the company of your family, friends, and guests. My wife and I get to enjoy a soothing, gurgling water feature in a river stone landscape on a daily basis all because of Shaylor’s Ponds & Patios! They even came back to give us more of a “whitewater” action to our three Mongolian Basalt Columns. We are delighted by the view and the sound which is just outside our front room windows. Definitely, Chad & John did a 5-star job creating this attractive and satisfying setting! Thank you very much! Both the quality of Shaylor’s work and their customer service are exceptional. They will work with you on all phases of any project, large or small—and even check back with you after the work is done. Wanted to let you know that Louise and I could not have found a better person to take care of our lawn than Andrew. We are so happy that you assigned him to us. We don’t have to supervise him, he knows what to do and does it in a professional manner. We hope you continue to keep Andrew on your staff. Shaylor’s does outstanding work. We contacted them several years ago about a landscape overhaul. Chad produced a beautiful design and helped us break it into stages for a gradual installation. The work is very professionally done and right on budget. Chad and all his staff are very conscientious about their work and the client’s needs. We highly recommend Shaylor’s. Covered in snow and turned off we still love our water feature. We even sit outside in the cold to look at it. One of the best investments we ever made. The Shaylor’s and their team – I can’t say enough good things about them and the experience. We told Chad where we sat, what windows we would view from and gave him a budget. Then we let him do his thing. The man is an artist. He can “see” it before he even starts. He exceeded every single expectation and then some. The job was complete, we didn’t have to lift a finger. And the way these guys work together ….. long hours in the hot sun, yet they all have smiles on their faces. A true stress free pleasure that continue to give us joy 365. At Shaylor’s Ponds & Patios, our passion and main focus is on assisting you with getting the most enjoyment possible from your own property by maximizing the utility and function of your pond or waterscape. Allow us to make your dreams come true in ways that you have never imagined possible. Keep up-to-date with the latest events at Shaylor’s Ponds & Patios, including our Pond Tour and exciting fundraisers, and helpful information throughout the year by visiting our Blog and Events Calendar. Shaylor’s Ponds & Patios specializes in the installation and maintenance of beautiful high‑quality ponds and other attractive water features that significantly enhance the physical attractiveness of your property, as well as the emotional well being of your family and guests. Historically, the elite were the only individuals able to afford and enjoy the relaxing mental and emotional benefits of high-quality water features. Now, you can experience the health-enhancing experience of having a year-round water feature on your own property. In addition to premium ponds, fountains, and water features, Shaylor’s Ponds & Patios offers comprehensive landscaping services and hardscape installations, as well. Shaylor’s Ponds & Patios is fully committed to using only the finest quality and most durable hardscape, waterscape, and landscaping materials for your installation to ensure that your project will endure for the long-term. We elected to place our family name on our company because we take great pride in upholding our reputation and doing the best possible job on your property maintenance or improvement project. Create outdoor living spaces that fit your lifestyle | Customer focused and passionate about our work! We are excited to offer new services to you! Now you can get a full lawn care treatment all in one place. Contact Chad Shaylor of Shaylor’s Ponds & Patios to learn more about our fine quality pond and waterscape installation and maintenance services, hardscape design and installation, and year-round landscaping services. Call: (570) 419-1518. You may request a quote for any of our services with our convenient contact form.